This weekend I attempted something I have seen floating around on both pinterest and Facebook: Egg Shaped Rice Krispy Treats. Now I did decided to go extra special in doing so and make them cake-batter flavored. We love cake-batter flavored Rice Krispy Treats. When I make them they go faster than most any other dessert that I make. So naturally I thought it would be fun to have them in an Egg shape for Easter. Well let me tell you the egg shape was a bust. I found out just how messy it is to put them in the eggs. I also forgot to use non-stick spray. So the eggs stuck to the plastic shells. From there I could not get the two halves of the egg to form together into one solid egg. 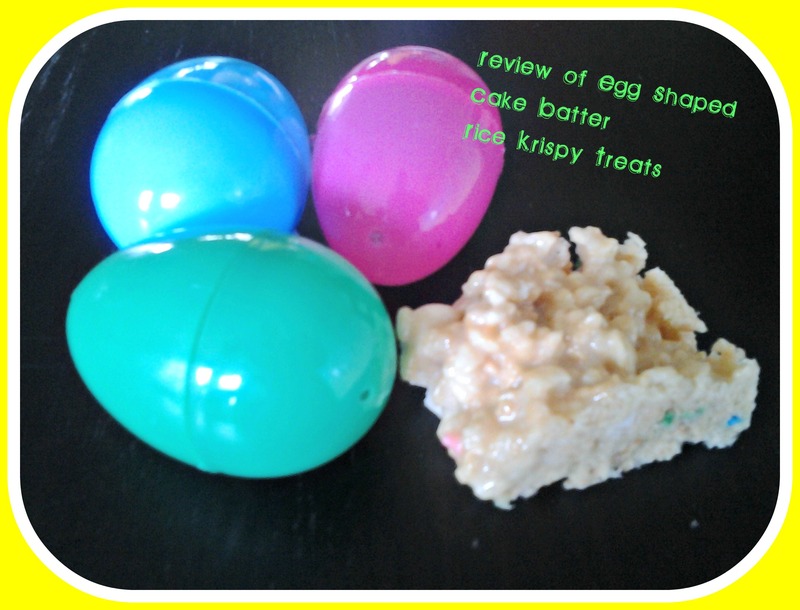 My verdict: The egg-shaped Rice Krispy treats are not worth the hassle. I took my remaining batter and simply formed your traditional Rice Krispy Treats. If you are looking for a tasty recipe that is a little different from normal and sure to be a big hit check out Gimme Some Oven. 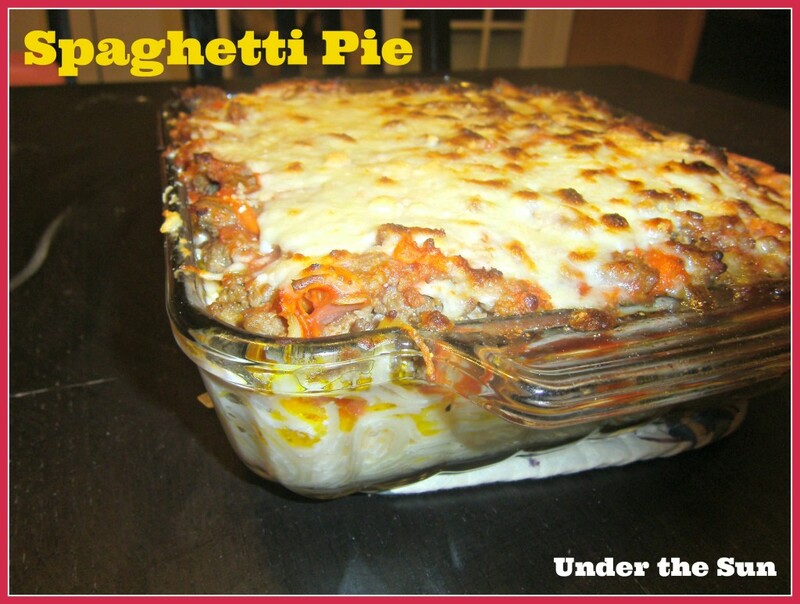 This entry was posted in Homemaking, Recipes and tagged dessert, homemade, review on April 21, 2014 by Sara R.
What follow is my grandmother’s recipe for spaghetti pie. This recipe has been in my family for as long as I can remember. My grandmother would make this for me and my cousins when we were younger. Generally speaking this is a recipe that I have left untouched over the years. Most recipes I tend to tweak to my desires. This is comfort food pure and simple. So what I will do for you today is share my grandmother’s recipe as is, and in italics share with you the changes I made in it for tonight’s go. Cook spaghetti according to directions on package; drain. Add margarine to hot spaghetti, add Parmesan cheese and well beaten eggs. Mix well. Spread spaghetti mixture in a greased 10 inch pie pan to make a crust. Spread cottage cheese over the top of spaghetti. Cook ground beef (sausage, onion, garlic, and carrot); drain. Return drained ground beef or sausage to skillet. Add spaghetti sauce; mix well. Spread spaghetti sauce over cottage cheese. Add mozzarella cheese and Parmesan. 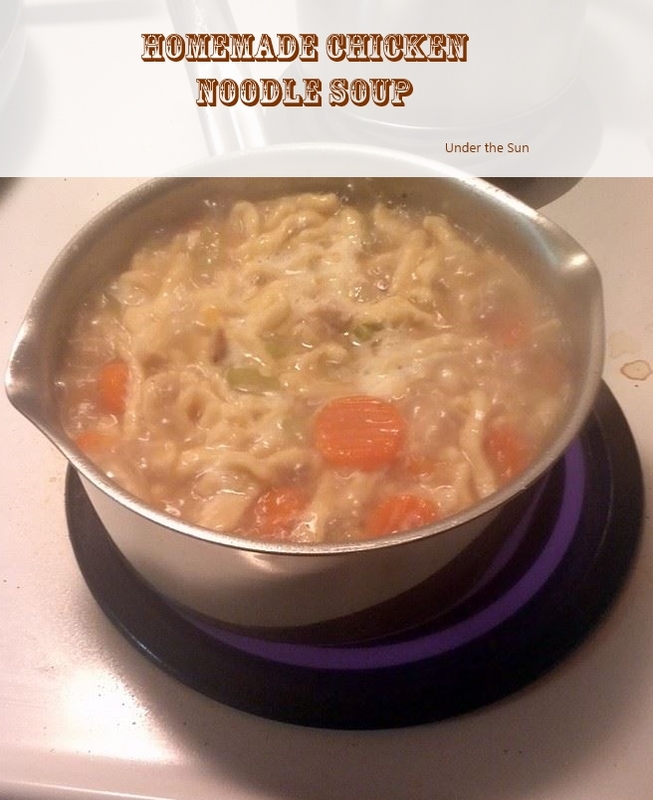 This entry was posted in Homemade, Recipes and tagged Recipe on February 4, 2014 by Sara R.
There is hardly anything as comforting on a cold winter’s night as a bowl of hot soup. To me there is no soup better than that which was homemade. From beyond that point I am not overly particular. You could serve me a creamy tomato soup, zuppa toscana, potato, chili (is that a soup? ), etc… But one that is easy and very forgiving is chicken noodle soup. Don’t have chicken? Use turkey. Out of carrots? It’s okay it is still a delicious soup. You get the picture. Recently though I thought I would try making my own noodles for the soup and let me tell you what, amazing! It was so much more comforting and filling having fresh noodles in the pot. Cook your chicken in either a lightly greased fry pan or a non stick pan, after having seasoned both sides with your poultry seasoning. While your chicken is cooking add your vegetables to the pot with your broth. Flip your chicken. Finish cooking on the other side. Now I use a pair of shears (that I keep just for meat) to cut my chicken up to add to the soup pot. If you don’t have sheers just chop up your meat. Turn your pot down to a simmer, and cover with a lid. When you are done making your noodles go and check on your pot that has been simmering. When your carrots are fork tender and your noodles. *If you like a soup that is a little heavier on the chicken by all means add more. But then you will also probably need to add more broth as well. Also it is worth noting this is a good way to use left-over chicken, say from a roast. If that is the case just chop up your meat into small pieces and throw in the pot. 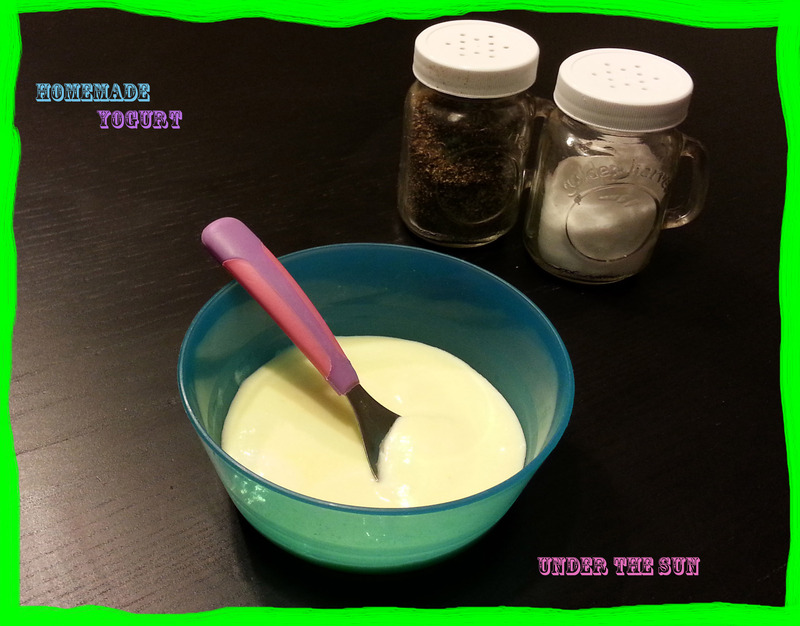 This entry was posted in Homemade, Recipes and tagged Children, Recipe, soups on January 7, 2014 by Sara R.
Yogurt, we eat a lot of the stuff, and when I say a lot I mean that we can finish a half-gallon of it in less than a week. It is a staple around here. We use it in smoothies, baked goods, top it with granola, top it with fruit, eat it plain, and more. The point is when I learned that it was something I could make at home I was intrigued. When I learned how easy it was to make I was thrilled, in fact I would say I was grateful. Today I would like to pass along the instructions to make your own yogurt. 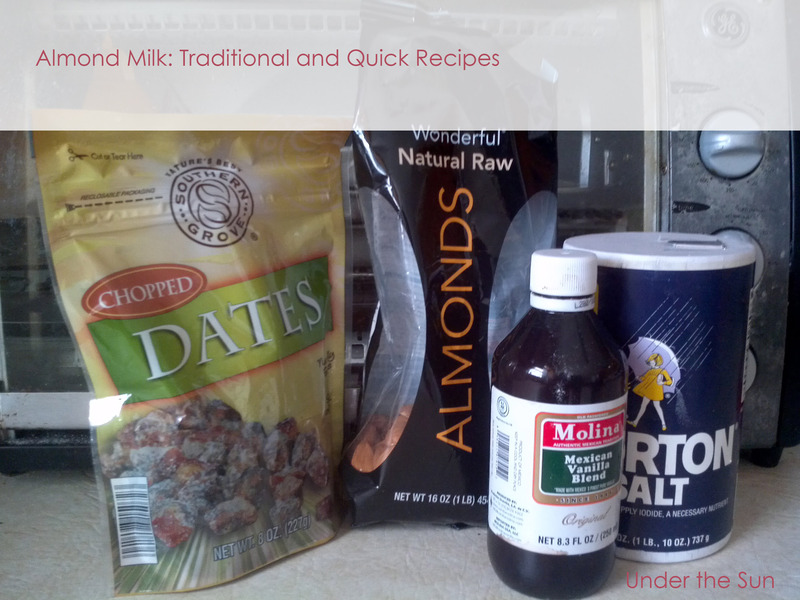 It takes time and patience, but the recipe I am sharing with you today does not require any specialized equipment, most likely just somethings you already have at home: a crock pot, and a large towel. I also highly recommend a meat thermometer, ideally a digital model. Pour a half a gallon milk into the slow cooker set to low. Let the milk come to temperature for 2 hours and 45 minutes. After that time has elapsed, if you have your thermometer, you will want to check the temperature. If you do not have a thermometer, do not fret you should still do just fine. I have done it plenty of times without one. I have just found getting it up to 185 degrees is what it takes to get that perfect consistency. Once the milk is at temp, you will need to turn off your slow cooker. Let the milk sit undisturbed for 3 hours. Scoop out 1 cup of milk into a small bowl. Whisk your starter and your milk together. Pour the mixture back into your slow cooker, and stir slowly. Let the towel and slow cooker sit in place for 8-10 hours. Do not peek. Resist the urge. Once your time has elapsed you portion it out into smaller containers for storage in your fridge. Now you can enjoy plain yogurt! If plain yogurt is not your thing you can flavor it with: jams/ jellies, honey, pudding mixes, extracts (such as almond or vanilla), or top with fruit. Whatever you choose mix gently, otherwise you risk breaking the yogurt up. Now if you want to try this recipe or it just intrigues you, pin it or share it on your Facebook wall. Having it in either or both places will make it easier for you to come back to later. 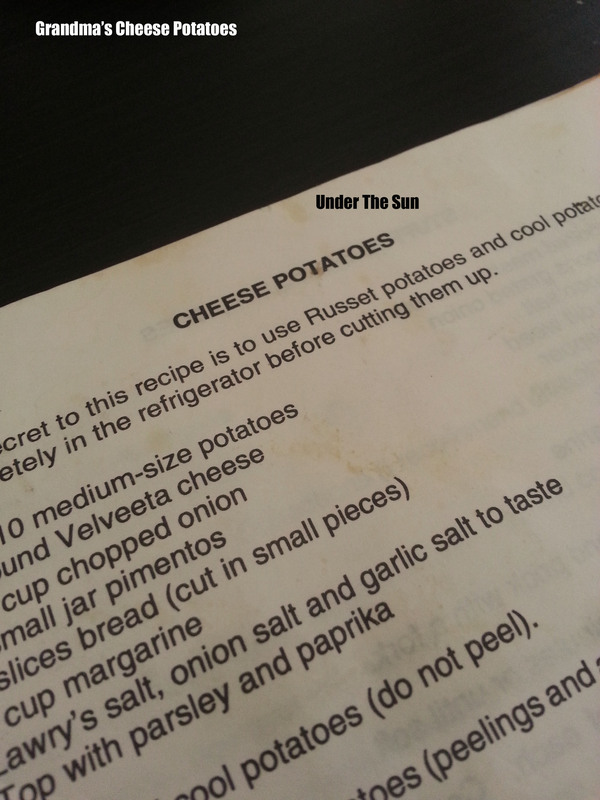 This entry was posted in Homemade, Recipes and tagged November, Recipe, Thankfulness, Thanksgiving on November 20, 2013 by Sara R.
Grandma says the secret to her cheese potatoes is using Russet potatoes and to let them cool over night. In the last ten years I have been making them, I would have to politely disagree with her, it is her love that makes the potatoes special. She has made them many a times and every time with love and care. I, in turn, have made mine with love and care as well. Granted she might shudder at some of the deviations I have taken over the years. I have strayed far from the original recipe other than it had potatoes and Velveeta, and come back around full circle to following it carefully to the letter. Each time though, having been made with love, they blessed the people who ate them. It was this experimenting of the recipe that has brought me to the recipe I am going to share with you today. I will warn you it is not a healthy recipe, not by a long shot. It is pure comfort food. It is food that is best reserved for special occasions. It does not serve the real food diet, clean eating, gluten-free, dairy-free, or even really an organic lifestyle. It is a dish that will take you back to happy childhood memories, cold winter days with hearty meals, the laughter of friends and family around a table, but will not fit into a healthy lifestyle. So treat yourself. Enjoy it. Just don’t make it every week. In large bowl, add cut potatoes, peelings and all. Then add cut-up cheese, bread, onions, and garlic cloves. Give a good stir, so that your ingredients are evenly mixed. Thoroughly mix in the seasoning. Transfer your potato mixture to a glass baking dish. Melt your butter in the microwave, and pour over your dish. Be sure to thoroughly mix in the butter. Top generously with parsley and paprika. Bake in a preheated oven at 350 degrees for 25 to 30 minutes. You will want to be sure the potatoes are warmed back through and the cheese melts. This entry was posted in Homemade, Recipes and tagged Family, Recipe, Thankfulness, Thanksgiving on November 6, 2013 by Sara R.
Recently, I have taken to making more food than I had ever thought possible. I have tried my hand at toaster pastries, gnocchi, cheese, pizza dough, pretzel bread, and then the one the surprised me the most: homemade butter. 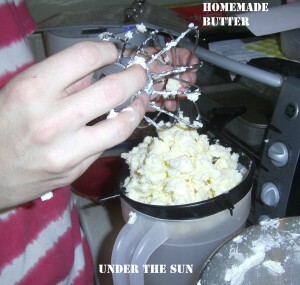 Making butter at home is relatively easy and interesting. 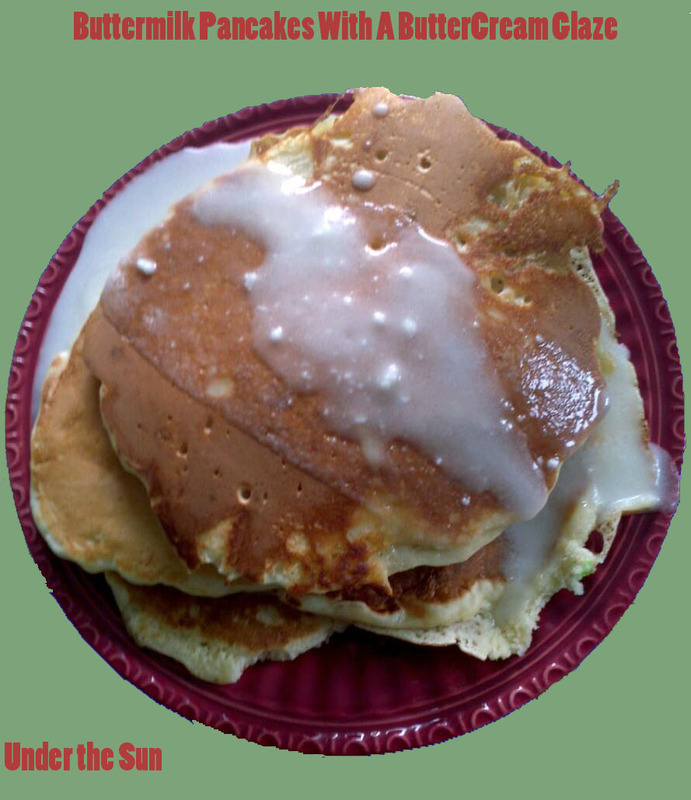 If you don’t use the buttermilk that forms in the process I would argue it is probably not any cheaper than buying butter, but if were already buying buttermilk as well as butter it might be worth it. It also might be worth it just to have something to try, and to show the kids. For this recipe you will need a stand mixer and heavy cream, and if you want salted butter 3/4 teaspoon per quart. 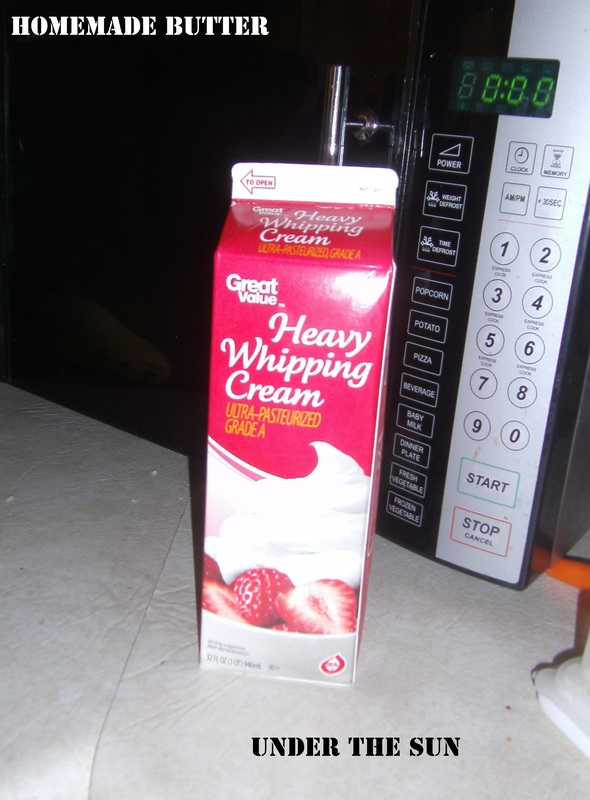 One quart of cream will give you roughly a pound of butter. 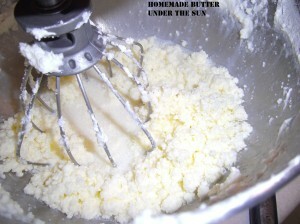 If you are making unsalted butter this is the only ingredient you will need. Otherwise add your 3/4 teaspoon salt now. 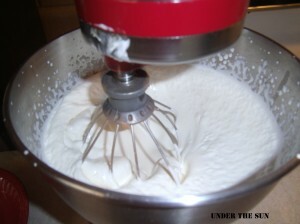 Using your whisk attachment start mixing on a lower speed. 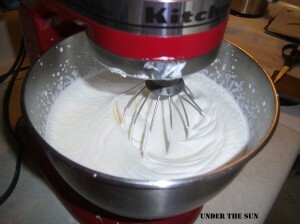 When the cream starts to thicken some you can turn up the speed to a medium high. The longer it mixes you will notice it starts to become whipped cream. You will want to keep mixing beyond that point, occasionally scrapping the sides of the bowl. It will start to thin out and get clumpy. 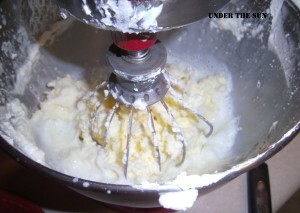 The butter is ready when the butter is sticking to your whisk and you see the buttermilk in the bowl. At this point you will want to strain your butter. 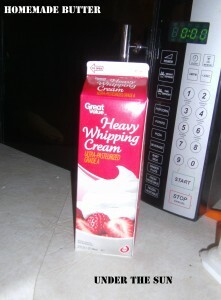 Be sure to pick it up, and try to squeeze out as much of the butter milk as possible. Now that you have your pound of butter, you will want to rinse it off. Run it under cool water, and then submerge it in a bowl full of icy water. (And I do mean lots of ice in the water!) Let it sit there for about 5 minutes (longer if you wish, but at least 5 minutes.) Drain off the ice water, which should have slight milky color about it now. Store your butter in a piece of Tupperware in the fridge. The more of the buttermilk you drained off the longer it will last. If your didn’t drain it well it could spoil in days, otherwise it will last a while. I have read up to 4 weeks in the fridge, but I will be honest with all the baking I do it doesn’t last that long around here. I am lucky if homemade butter lasts a four days! 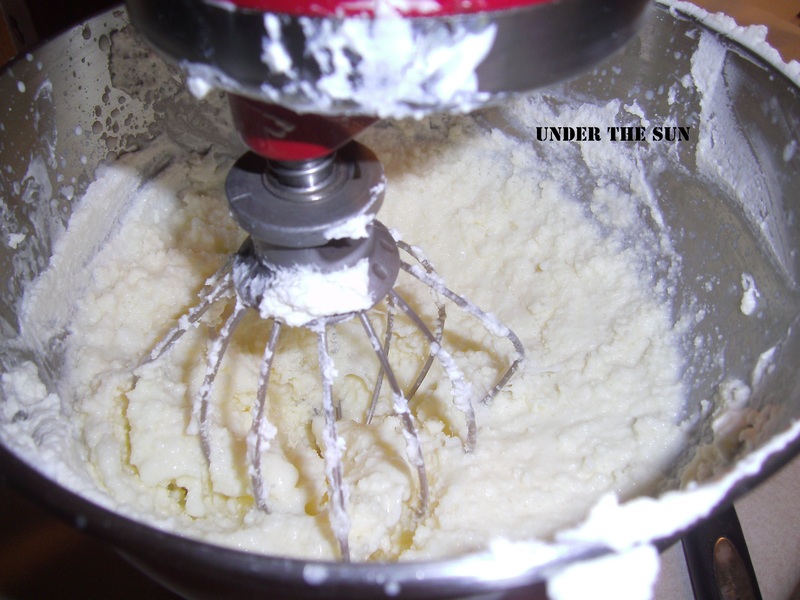 This entry was posted in Homemade, Recipes and tagged butter, Recipe on October 30, 2013 by Sara R.
I recently discovered how easy it would be to make my own mozzarella. So about two weeks ago now the husband and I decided to go for it, we had been considering it for a while but eventually you just need to jump in. We ordered the vegetable rennet on Amazon and Amazon Prime had it to us in time for use on Saturday. We made roughly two pounds of cheese that first Saturday, for just a little over $5, seriously. 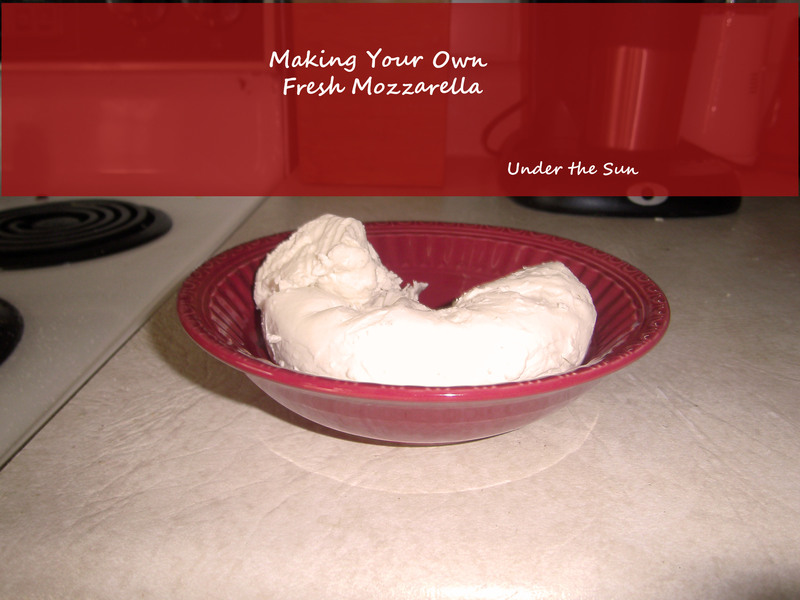 Now depending on the cost of milk in your area a pound of fresh mozzarella can run you from $2.5 to $6 a pound, it just depends on what you are paying for milk. I found making our own fun and far more cost-effective than buying it. I will give you the recipe and let you be the judge for yourself. This last Saturday, we celebrated our oldest daughter’s fourth birthday, and we had homemade pizza for dinner that night. Now I could have easily pulled out the frozen ball of cheese from the week before for use on the pizzas that night but a friend wanted to try his hand at it. So we let him make the cheese for the pizza that night. I gave him the directions I had, and the husband and I helped him, with our experience we gained from the time before. In under an hour, probably closer to half an hour, we had fresh mozzarella for pizza. Making the mozzarella leaves you with lots of whey. Now the whey need not go to waste. It can be used in baked goods in place of water, in smoothies, or even in soups. If you come up with other suggestions I would love to hear them! In a small bowl measure 1 cup of cool water. Gently stir in your citric acid, until dissolved. In a second small bowl measure 1/4 cup cool water. Gently stir in your rennet until dissolved. Once the milk has reached 90 degrees add your water and rennet mixture, while stirring your pot continually until you have reached the count of 30. Then stop stirring, remove your pot from the heat, and cover your pot. Let the pot sit covered for 5 minutes. After 5 minutes you will need to uncover your pot, and check the consistency of the milk. The milk should have set and resemble silken tofu. If you can not tell by visual inspection gently touch the top. (If it has not set let your milk sit another 5 minutes.) Cut the curds into a grid pattern, ensure that you cut all the way through the curds with your knife reaching the bottom of the pan. I recommend about one inch size squares. Put your curds back on the burner. You will need to cook them until they reach 105 degrees, stirring the pot of curds all the while. You don’t want to break up the curds too much, so stir the curds along the grid pattern you cut previously. As you cook them more they will further separate from the yellow whey. 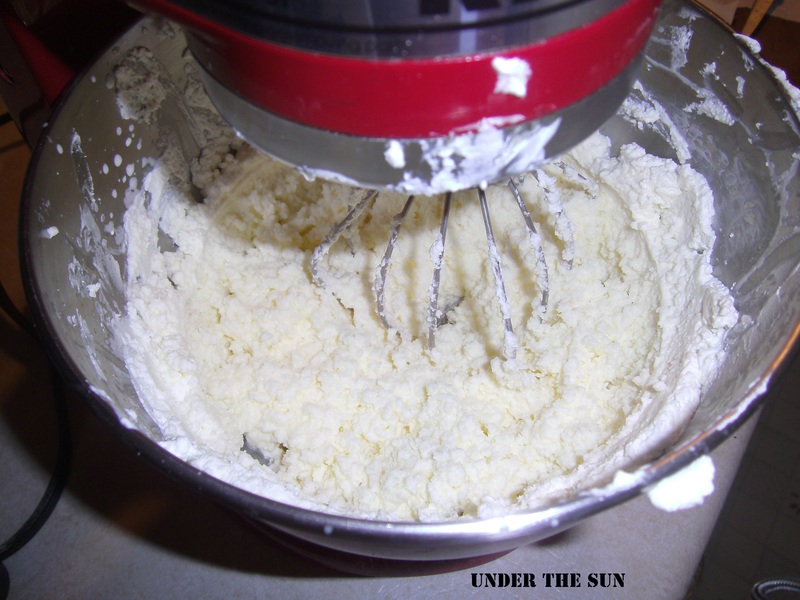 Using your sieve separate your curds from the whey. Put your curds in a microwave-safe bowl once separated. Put your bowl full of curds in the microwave for one minute. Using your sieve drain off the additional whey that is in the bowl. For the record, at this point the curds should resemble cottage cheese. Once the curds are up to temperature, you will need to stretch them. Sprinkle your salt over the curds and work it in with your fingers. Using both hands, fold and stretch your cheese . You will want to be careful to not over work your cheese. You will know it is done when it is firm and has a glossy sheen. At this point you can shape your cheese into one round ball or a couple smaller ones. If you shape it into several bite sized balls those are called: bocconcini. 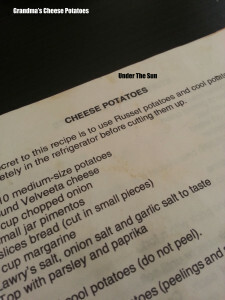 This entry was posted in Homemade, Recipes and tagged cheese, Recipe on October 23, 2013 by Sara R.
Yesterday, we had tacos for dinner, a favorite around here! To give you perspective Chloe had two servings of taco and asked for a third. We have enjoyed trying variations on the ground beef taco. We had tried: ground turkey, shredded chicken, shredded pork, shredded beef, and even ground chicken. Although popular with many people, we will not be eating fish tacos in the Russell household, Mr. Russell is allergic to seafood. Any way one thing has always been the same in our taco night fun though, store-bought tortillas. Last night was the first night we ventured away from that one constant into the realm of homemade flour tortillas. I have to admit that homemade tortillas were a hit around here. The kids enjoyed watching me make them, they were very easy to make. They were far tastier than the store-bought variety. And the best part to me was they were far cheaper than the store-bought ones, especially considering I already keep all the ingredients on hand. Now some of you may wondered why this calmed me. Simply put, I fried up some bacon. The grease from the bacon is just rendered bacon fat and after cooking the bacon I just took it and cooled it for use in the recipe. I found this recipe on allrecipes.com and I thought I would give it a try. It is a simple enough recipe. The process is a little time-consuming so you will need to plan for plenty of time to roll out your tortillas. I also would like to note I made up a full batch of dough but only used half of it last night. The other half I lightly greased (to keep it from drying out) and then I froze it for later use. I will update this later to let you know how the dough held up to freezing. In a large bowl, preferably that of a stand mixer, add flour, salt, and baking powder. Stir your ingredients together. Add the lard. Work it in with your fingers, until it resembles course crumbs. 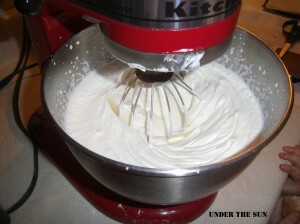 Using your dough hook, slowly incorporate the water into the mixture. If after the water is added the dough appears very sticky you will need to add a little more flour at a time until the dough is smooth. Turn your machine on high and use it to knead the dough for 3-4 minutes. When you are done kneading the dough the bowl should be mostly clean and the dough should be smooth and somewhat elastic. 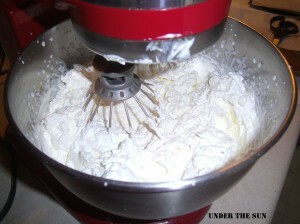 Now remove the dough divide it into 24 equal pieces, rolling it up into little balls. Preheat your skillet. The heat should be medium high. Roll out each little ball, into a thin sheet, on a lightly floured surface, using a lightly floured rolling-pin. 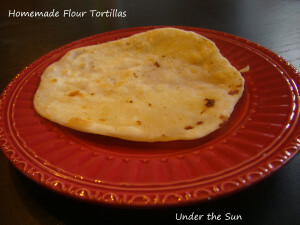 Cook tortillas till they are bubbly and golden on each side. This entry was posted in Homemade, Recipes and tagged homemade, Recipe, tortilla on October 9, 2013 by Sara R.